For most folks the term "food plot" conjures up images of an expansive sea of green filled with unlimited potential. As the sun slowly skins in the western sky you watch the first deer filter out, a couple fawns followed shortly thereafter by a watchful doe. Soon more deer appear, at first peeking from safe cover and then, seeing a few of their kind feeding in the open they venture out. Next come the young bucks, alternately feeding and harassing nearby does that aren't quite ready to receive their affections. In time the herd grows and, nestled comfortably inside your shooting house you watch, patiently waiting and wondering if all the painstaking effort, time and money you put into building the plot will eventually pay off. Building big plots is certainly an effective way to coax wiley whitetails into the open; but it's not the only way. There are some very effective alternatives for folks who lack the ways or means to build big plots. You may not have the acreage, equipment or time, or existing conditions may make hot areas inaccessible with large equipment. Whatever the case, there are several ways to create attractive plots with minimal effort and equipment. One of the easiest and least expensive is to let someone else do most of the work for you. Chances are you have some timber on your property that you may occasionally have cut for lumber, pulpwood or firewood. It can be a great source of income for other management projects but the process of cutting or thinning also creates more attractive deer habitat. Cutover areas will soon grow back with stump sprouts and coarse woody browse that make up much of a deer's fall and winter diet - creating an instant food plot. Later, it becomes dense bedding cover. Skidding and hauling logs also creates linear stretches of bare ground that provide the ideal starting point for small food plots. Again, the hard work is done for you with someone else's equipment. You need only to add a few of the right ingredients and let mother nature do the rest. Those ingredients include, fertilizer, seed and maybe lime; and here, as with any sized plot, it's important that you apply the right type and amount. Whether it's 100 acres or 1/10 of an acre, you should first test the soil and get a prescription. 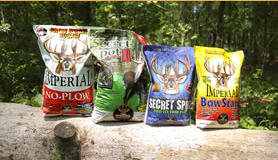 Once the fertilizer and lime, if necessary are down you need only to add your seed mix, and Whitetail Institute has three products that are specifically designed for such situations. Imperial No Plow, Secret Spot and Bow Stand can all be planted with minimal ground preparation sufficient to expose the soil in order to establish good seed-to-soil contact. They can tolerate a wide range of soil conditions and as little as three to four hours of sunlight a day. Further more, they're fast growing and will provide nutrition as well as outstanding attraction for up to nine months. Even if you aren't logging you can still create small "deer attracting" plots with the above blends and minimal equipment. All you need is an opening in the canopy large enough to let sufficient sunlight in for three to for hours and a few hand tools. 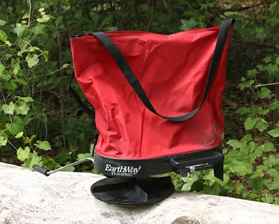 The equipment list consists of seed and fertilizer, a backpack leaf blower or a rake. I actually prefer the rake because I can scarify the soil a little when I'm clearing my plot, which helps enhance germination. For seed and fertilizer, an area of 4500 sq. ft. (22 yards x 23 yards) call for approximately one 50-pound bag of Triple-19 (or equivalent) fertilizer, four pounds of seed. Total cost is less than $30. 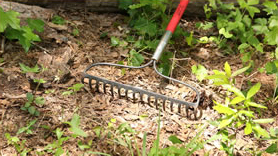 To build the plot simply blow (or rake) the leaves and any existing vegetation away, by hand or with a hand-held spreader. Walk over the area a few times to tamp down the soil. This will provide better seed-to-soil contact and enhance germination. Then spray the seeds with a misting of water. If you want bigger plots but don't own any heavy equipment there's another option. Most hunters own an ATV, or know someone who does. Add a few small implements like a disc harrow and a spreader and you can build medium-sized plots without a tractor, often in places you couldn't access with a tractor. Most any ATV of 400 ccs or greater will work but bigger is better and 4WD is highly recommended. Preparation will vary with existing conditions but you want to start with loose, bare soil, then treat and plant the same as you would larger plot. If your implement doesn't have a roller, simply ride over the plot a few times, flattening the soil before and after spreading the seeds to promote better seed-to-soil contact. In addition to being quick, cheap and easy to build, another advantage of smaller plots is they can be built at the last-minute. 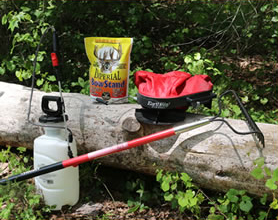 You can locate a hotspot just before, or even during the hunting season, plant it then hunt it, all in less than a month. 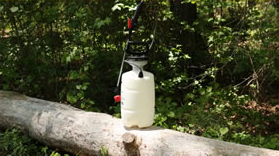 Your biggest limiting factors are sufficient rain and growing season. You've got to get the plot planted to be able to hunt it.